AVX/Kyocera produces a broad range of high quality ceramic resonators. The high quality and extensive coverage of this product line allows optimum design of almost any oscillating circuit. 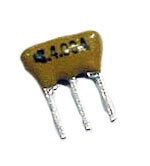 Ceramic resonators stand between quartz crystal oscillators and LC/RC oscillators in regard to accuracy but are considerably smaller, require no adjustments, have improved start-up times, and are low in cost.